From the rugged cliffs of the Yorkshire coast, the picture postcard villages and purple heather of the North York Moors to the sweeping Dales and drystone walls of the Yorkshire Dales, you’ll struggle to find more beautiful scenery than in God’s own country. With such breathtaking scenery it’s no wonder that Yorkshire has made an appearance in numerous shows and films throughout the years, from Heartbeat (filmed in the North York Moors village of Goathland), All Creatures Great and Small and Rising Damp to blockbuster hits such as Harry Potter and Calendar Girls, you’re sure to bump into some familiar sights on your Yorkshire holiday. Yorkshire’s also provided the inspiration for some of the most famous works of literature in the canon, from Dracula (inspired by Whitby’s famous Abbey) to Wuthering Heights (set in the moorland around Haworth), discover the settings for yourself and prepare to be inspired. Yorkshire has a fantastic calendar of festivals and events held throughout the year, from agricultural shows showcasing the best of Yorkshire’s farming and local produce, food festivals that give you a taste of Yorkshire’s local delicacies such as the Malton Food Festival, and amazing sporting events from cricket to the annual Tour de Yorkshire- there’s something for everyone to enjoy. 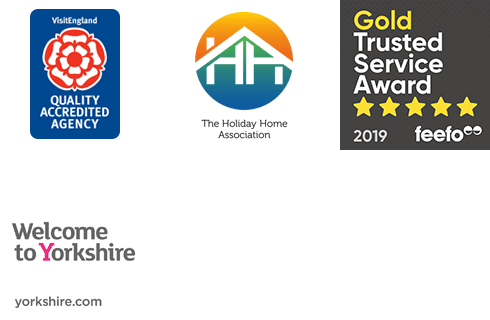 Take a look at some of our cottage selections below, whether you’re interested in our new properties or looking for seasonal availability, we have a fantastic selection of properties in the White Rose county.